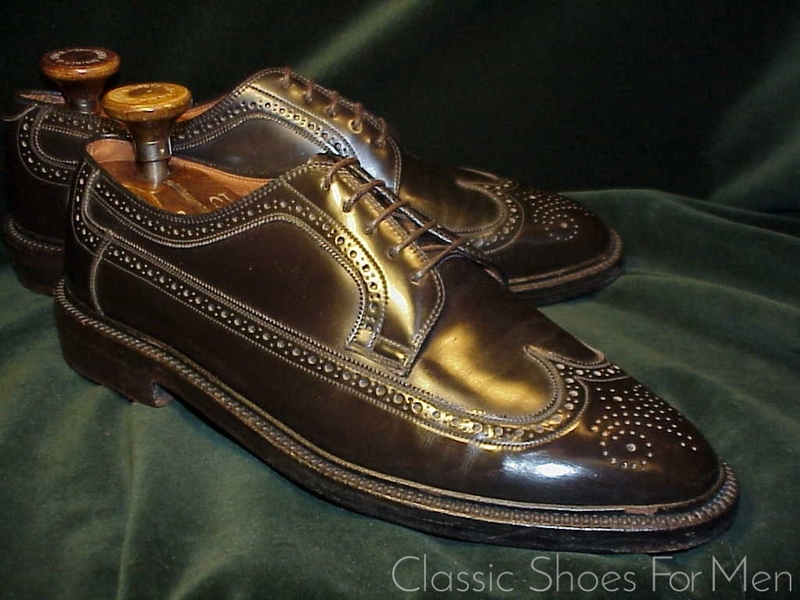 DuPont’s ill-fated Corfam was the first poromeric material in history and was introduced in 1963 at the Chicago Shoe Show. It was the centerpiece of the DuPont pavilion at the 1964 New York Worlds Fair. DuPont manufactured Corfam at its plant in Old Hickory, Tennessee from 1964 to 1971. 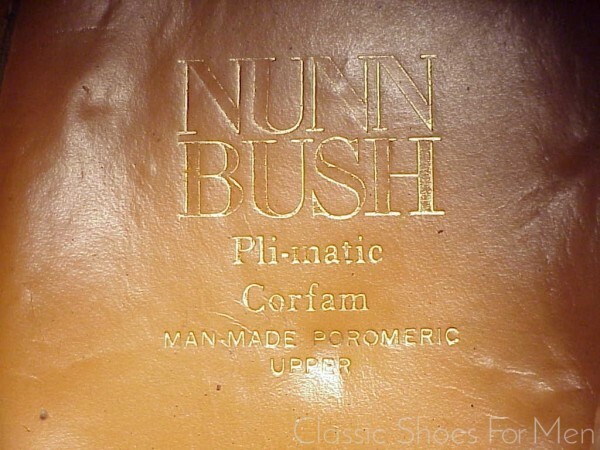 After spending millions of dollars marketing the product to shoe manufacturers, DuPont withdrew Corfam from the market in 1971 and sold the rights. While Corfam is mainly remembered as a textbook marketing disaster, it is still in use today in various products, for example certain types of equestrian saddle girth, and continues to be very popular in the military and other uniformed professions where shiny shoes are an asset. 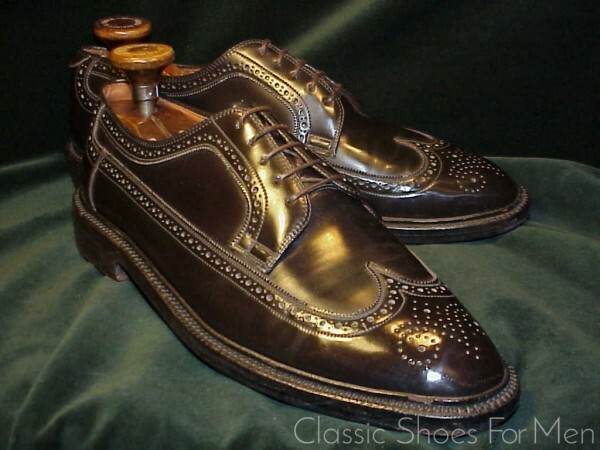 Its disadvantages were its stiffness which did not lessen with wearing and its relative lack of breathability. 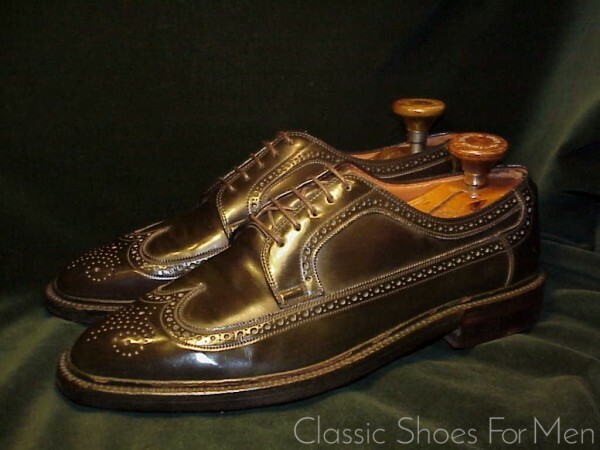 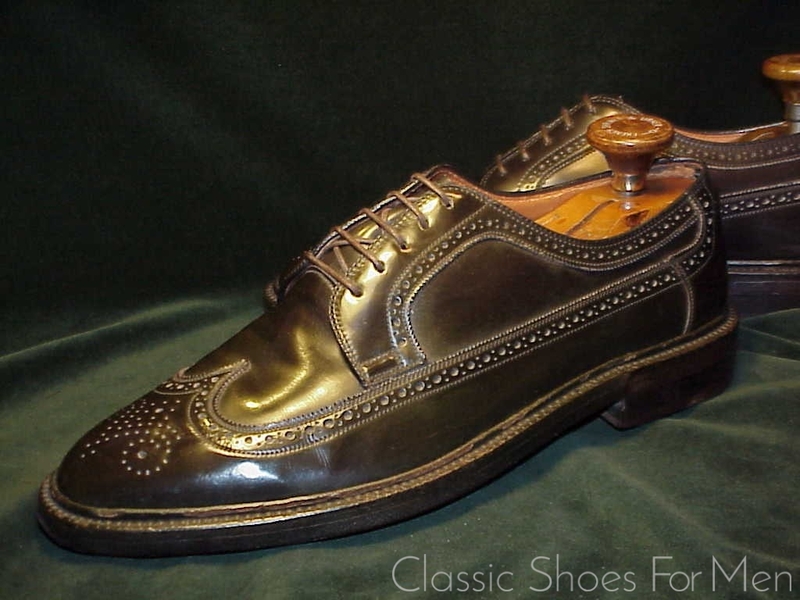 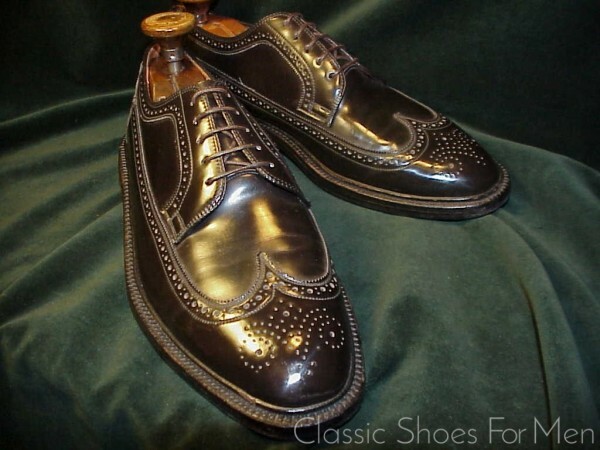 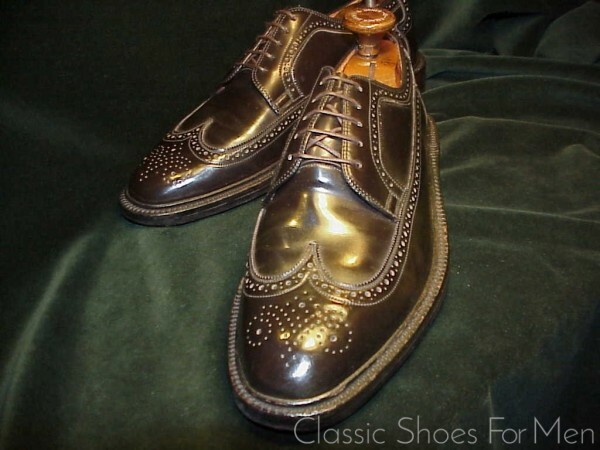 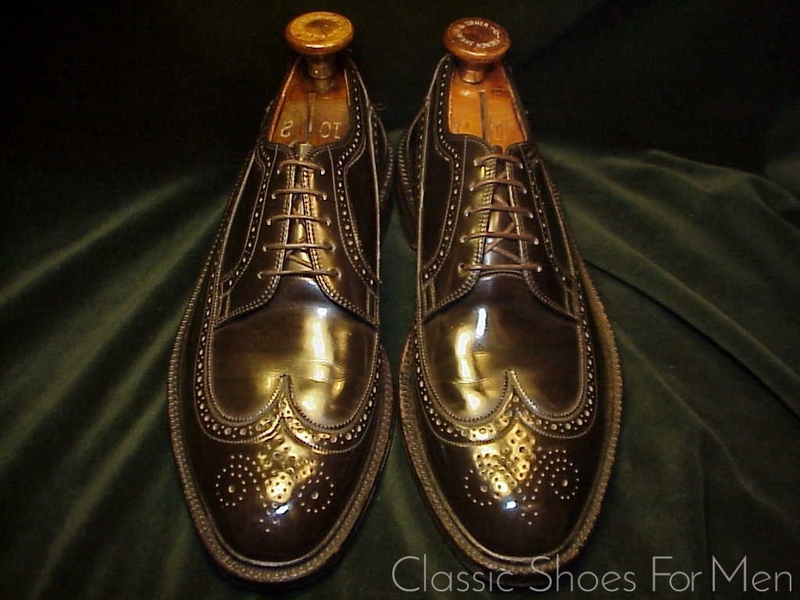 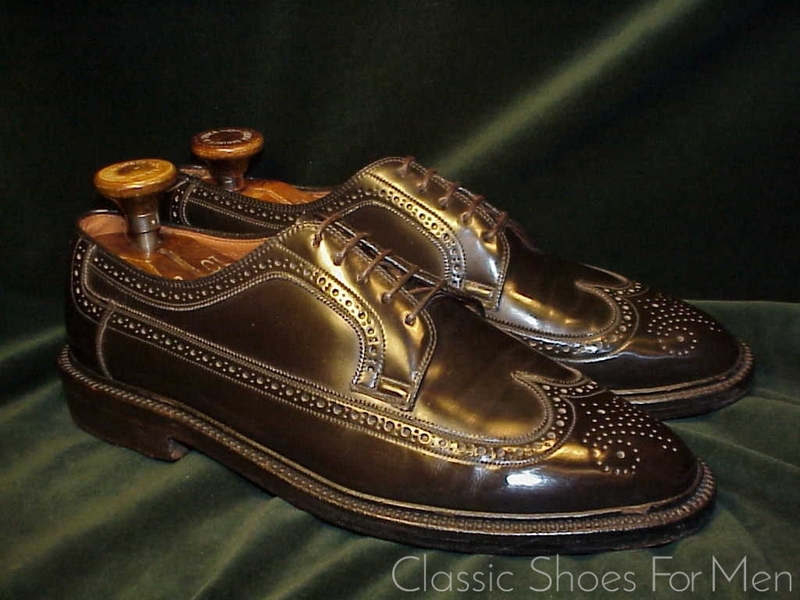 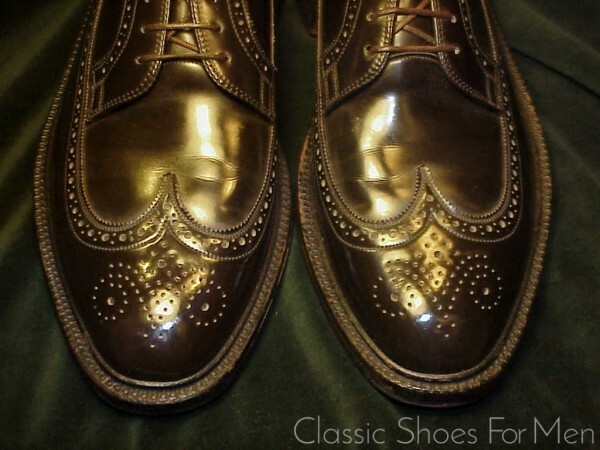 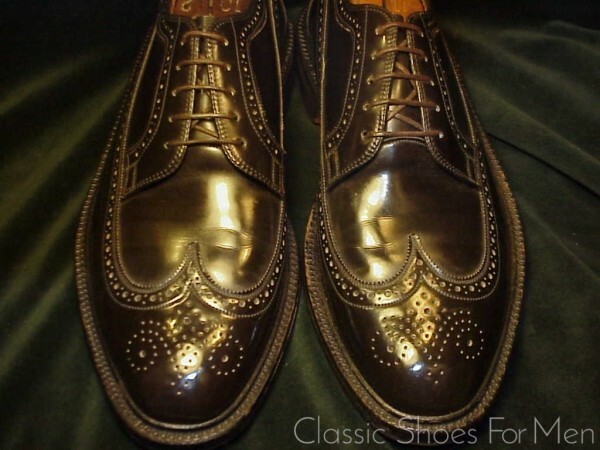 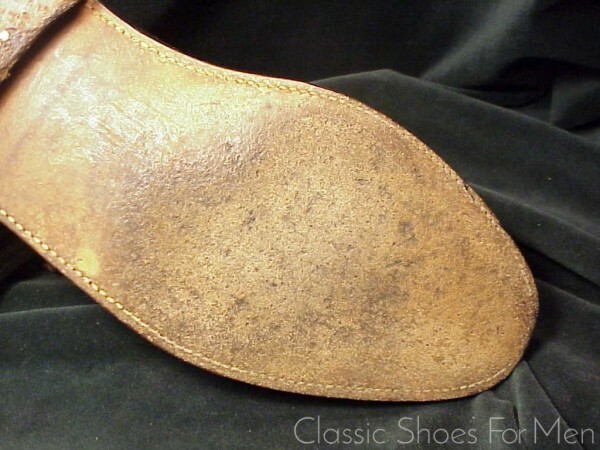 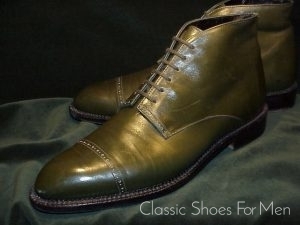 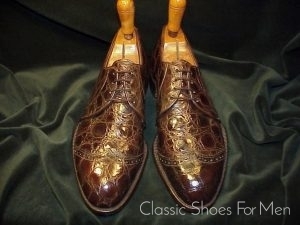 Its major advantages over natural leather were its durability and its high gloss finish that could be easily cleaned with a damp cloth and that it deflects dirt and wet rather effectively, in other words, an excellent shoe for the country or for attending a sporting event or a garden party in questionable weather. 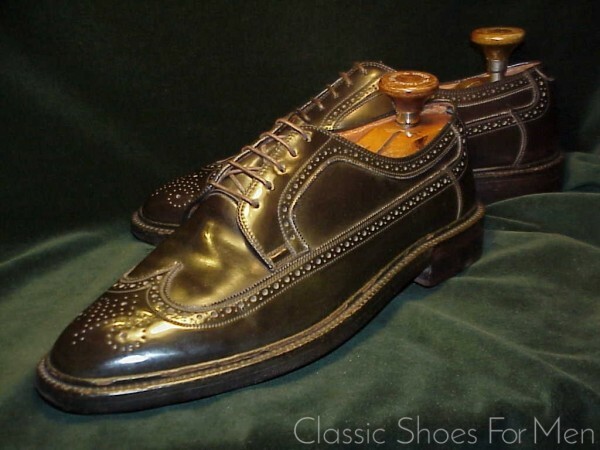 This leather lined Full Brogue Derby by the fine traditional American firm, Nunn Bush is a properly Goodyear Welted (Rahmengenaeht) Shoe. 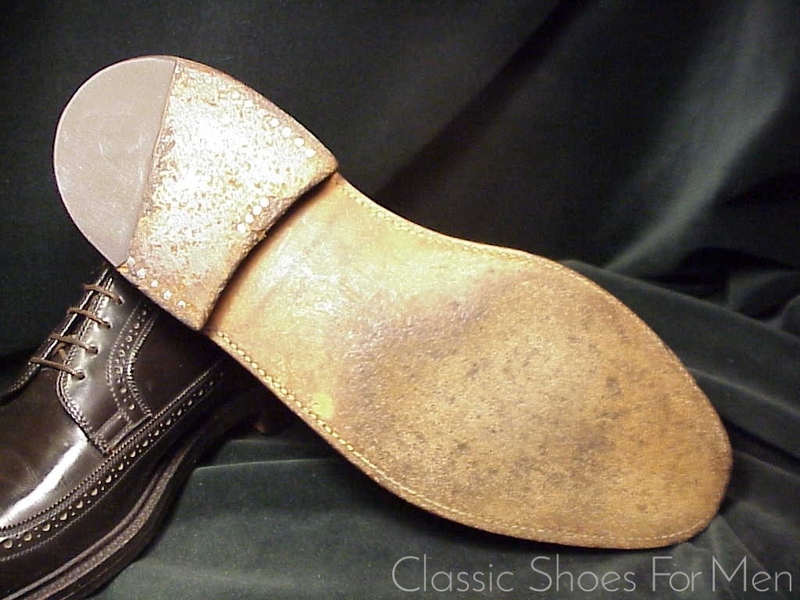 It is certainly a collectors item as this material was in use for only 7 years, 40 years ago. 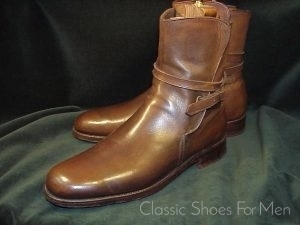 An attractive and highly practical shoe that presents you in good style while protecting you in every weather. 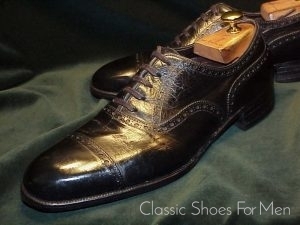 Size: Marked US 9.5D, correct for the European 42.5D foot. 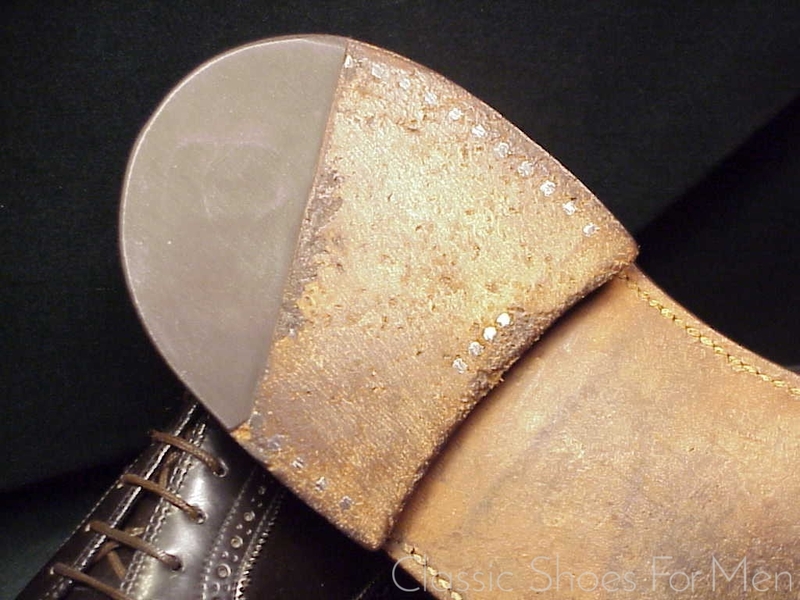 Grösse: Eine Standard-deutsche 42.5D (eine amerikanische 8C/D, UK 7C/D). Käufer zahlt EUR 6,90 Versandkosten als versichertes Paket. Verkauf ohne Schuhspanner /Sold without trees.